Ubisoft put on a pretty solid show today to kick off E3, highlighted by the next installment in the Assassin's Creed franchise. We already got a great look at what it'll be like teaming up with friends, but Ubisoft wasn't quite done showing off what's shaping up to be an incredible addition to next generation consoles. The single player demo of Assassin's Creed Unity takes players through Paris in 1793, where famine and poverty is rampant. Once again, the graphics are looking quite incredible, showing off a scale and level of detail that really shows off where the console market is headed. 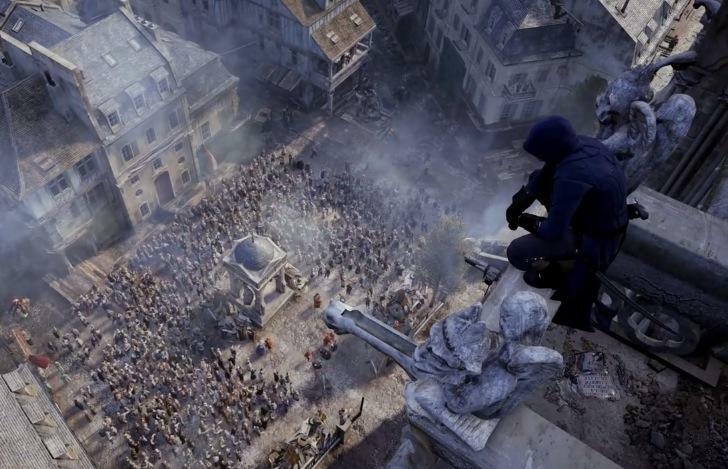 The amount of NPCs onscreen is impressive, and the way the assassins move throughout the city never looked so fluid. This over seven minute demo is commentated by Ubisoft, touching on the many elements that'll be introduced to Unity. Controlled assent is one aspect being added, and Ubisoft said there's been a complete overhaul of navigation, giving players more flexibility to plan and execute exactly where they want to jump. The idea is that players no longer have to find a haystack just to get down from a building, ultimately making the game a bit more realistic—and fun! Just like other Assassins Creed games, there are a lot of little side missions, giving players plenty to do outside of main missions. From what we can tell in the trailers thus far, Ubisoft has really created a living, breathing Paris, a place that's being lived in—not just a digital re-creation. My only experience with Assassin's Creed is the most recent game, Assassin's Creed IV: Black Flag, so I'm not burned out on the series like many others are. That said, Unity is looking pretty darn good, and that much better with a multiplayer angle involved. Check out the full seven minutes of Unity gameplay, and stay tuned for some more impressions as we see it on the show floor.